A junior, she authored arguably the finest hurdles seasons in FSU history in 2018…earned three first-team All-American honors, following a fourth-place finish at the NCAA Indoor Championships in the 60-meter hurdles with a bronze medal in the 100-meter hurdles at the NCAA Outdoor Championships…also contributed to scoring 4×100 relay…capped 2018 sophomore season by claiming bronze in the 100-meter hurdles at the IAAF Wolrd U20 Championships…set FSU 60-meter hurdles record (8.02) and ranks No. 2 all-time in 100-meter hurdles (12.86), both before celebrating her 18th birthday. Indoor: Capped a six-meet schedule with a fourth-place finish in the 60-meter hurdle finals at the NCAA Indoor Championships in an FSU record time of 8.02…result led to her first, first-team All-American honor…was the ACC Indoor Championships runner-up in an NCAA qualifying time and then PB of 8.05, helping Noles to the team title…dipped below 8.20 for the first time in a fifth-place finish at the Tyson Invitational (8.05)…brought along slowly after fall surgery limited her fitness. Outdoor: Cemented her reputation as a clutch performer on the championship scene with a bronze medal finish at the NCAA Outdoor Championships in the 100-meter hurdles (13.04), which was contested in the driving rainstorm…qualified for the final in 12.86; the fastest time in collegiate competition by an FSU athlete in school history…began the day by handling the third leg on FSU’s eighth-place 4×100 relay, which posted the No. 3 time in program history (43.33) in the prelims…dipped below 13 seconds for the first time in a wind-aided 12.93 to finish second at the ACC Outdoor Championships…opened seven-meet season in style, winning FSU Relays 100-meter hurdles in then-PB 13.06. Indoor: Finished third at the ACC Championships with a collegiate best time of 8.18 in the 60-meter hurdles, good for No. 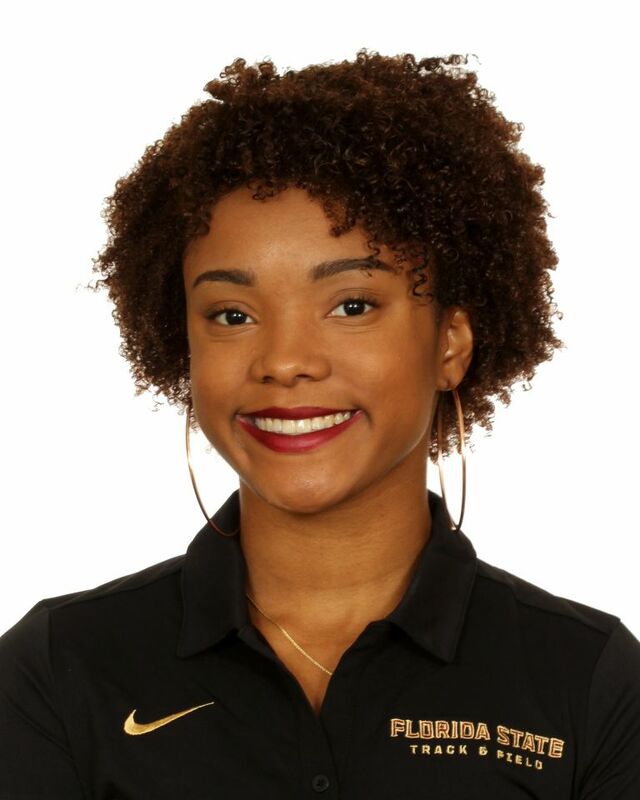 4 on FSU’s all-time list and first-team All-ACC honors…that time ranked 21st among all NCAA Division I women last season…missed NCAA Indoor Championships berth by .03 seconds just two months after enrolling at FSU in January…provided glimpse of upside with 60-meter hurdles debut of 8.26 at Clemson. Outdoor: Capped her seven-meet freshman collegiate season at the NCAA Championships where she finished 15th in the 100-meter hurdles (13.30) for All-American honors…followed that up with a fourth-place finish at the USATF Junior Championships…scored three 100-meter hurdles victories in rookie season, with a personal-best 13.06 for the win at the FSU Relays…that time ranks No. 5 in program history and was 21st nationally…was bronze medalist at the ACC Championships, good for first-team All-ACC honors. Capped decorated career at Rockdale (Ga.) County high school with lifetime-best 13.40 in the 100-meter hurdles to finish sixth at 2016 New Balance Outdoor Nationals…was silver medalist at both the GHSA state meet and Georgia Meet of Champion in the 100 hurdles…in 2015 was silver medalist at USATF Junior Olympic National Champinships (13.67), after claiming second consecutive GHSA state title…in all won seven state titles between the hurdles, high jump and relays…helped Rockdale to 2015 team title while contributing to 4×100 and 4×400 relay wins, to go along with her first of two consecutive high jump titles…won GHSA state title in 100 hurdles as a freshman in 2014 and was also on winning 4×100…a well-rounded student who served as class president for three years at Rockdale and was a SGA member for four years…was on principal’s list throughout her high school career…daughter of Tracy and Tony Jones…majoring in sociology with a minor in psychology.